The most common application of Optocoupler is signal isolation. It provides complete isolation because its input side is not electrically connected to the output side. Its input side is a light source which is commonly a LED, while the secondary side is a photo transistor. A photo transistor is also a transistor but without a base current. The absence of the base current makes the analysis easy and straight forward. One common application of Optocoupler is communication between the primary control and the secondary control of a power supply. 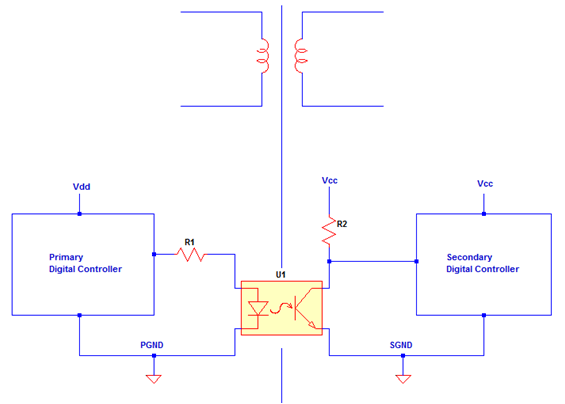 Nowadays power supply design is advancing; it uses digital control for the primary and the secondary. The primary side is the primary of the transformer. Any devices that shared a ground reference with the primary winding are treated as primary. On the other hand any components that referenced to the secondary winding ground are considered secondary. The primary side control cannot directly connect to the secondary control or vice versa. If you do so, the isolation provided by the transformer is defeated. The most preferred and economical way of connecting the two controls is by using an Optocoupler like in figure below. Another common application of Optocoupler is below circuit. Below circuit is a power supply, can be a flyback or a forward. The controller is located in the primary side controlling the power MOSFET M2. For the power supply to have a regulated output, the control should have information from the output. So the output is feedback to the controller located in the primary side using an Optocoupler as isolation element. For more complete explanation on how to analyze Optocoupler working in a feedback loop, read this. Another most common application of Optocoupler is to provide logic signal. If plainly for logic level detection why should not use BJT or MOSFET which are smaller and cheaper? Again, the core purpose why Optocoupler is used is to have isolation at the same time. I’ll go back to power supply as an example. 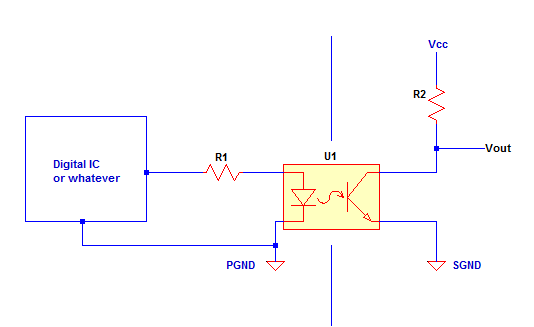 If there’s a need to monitor a signal from one ground reference and pass it to another circuit with another ground reference, you should use an Optocoupler as below circuit. Above circuit is can be operated in saturation (switch mode) or in linear mode. In operating as a switch, the collector-emitter voltage of the transistor is ideally zero. On the other hand when set to operate in linear region, the collector-emitter voltage is not zero but not equals to Vcc. 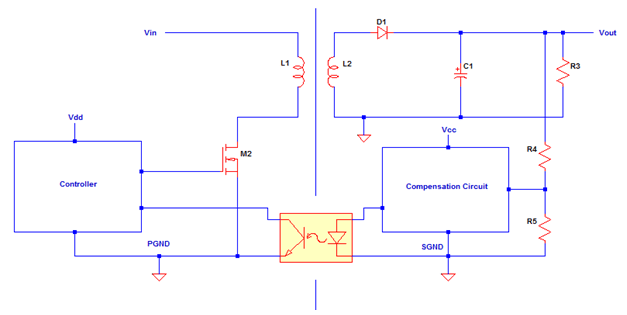 Read this to learn the complete tutorials on how to design an Optocoupler circuit. Very nice blog having various applications of Optocoupler in Electronics circuits which is backbone of electronics-engineering. This is very informative and conceptual article. I like it.